So much for Rick Bonnell’s guess that the Bobcats wouldn’t be participating much in the trade deadline madness today. After completing the Tyrus Thomas deal (initial post here, more analysis still coming) and engaging in talks about a DJ for TJ Ford swap, Yahoo! Sports’ Adrian Wojnarowski is reporting, via his Twitter feed, that the Bobcats have obtained shot-blocking veteran center and Larry Brown favorite Theo Ratliff from the San Antonio Spurs. At the time I write this, all we have is Woj’s initial Tweet. We have no idea who (or what) the Bobcats are giving up — or even really if this trade is official. Ratliff is a 14 year veteran of the league after being drafted by the Pistons in 1995. He had his glory days in the late 90s/early 00s with the Philadelphia 76ers and then Atlanta Hawks, respectively. With the Sixers, the tough and defensive-minded Ratliff was a favorite of then-coach Larry Brown. However, in the midst of his best season (2000-01), while averaging 12.4 points and an astounding 3.7 blocks per game, Ratliff suffered a season-ending wrist injury and was traded to the Hawks for Dikembe Mutombo. The Sixers would go on to make the Finals with Allen Iverson as the centerpiece in one of Brown’s finest coaching achievements. As his career has wound down in recent years, Ratliff has become a true journeyman, playing for the Blazers, Hawks, then Blazers again, Boston, Detroit again, Minnesota, then back to Philly. 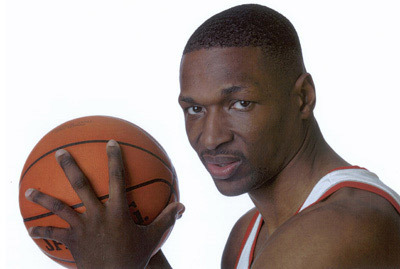 Ratliff was humorously dubbed “Theo Ratliff’s Expiring Contract” by ESPN.com’s Bill Simmons due to all of the trades, rumored and otherwise, that Ratliff was a part of in recent years. This year, he was signed by the Spurs to a one-year deal for 1.3 million. Though he still appears to be in great shape, he’s only appeared in 21 games for the Spurs, averaging less than a bucket, but still one block, per game. For Charlotte, this clearly means that some of the very recent injury concerns among the bigs are significant. Tyson Chandler has been battling foot/ankle issues since last season that appear to still be problematic, Gana Diop has a sprained knee that may keep him out for two weeks, and Nazr’s been bothered by back spasms this week. Rick Bonnell is reporting that all three of those guys may be held out of Friday’s matchup with the Cavs, so we may see Ratliff move from the end of the Spurs bench to the Bobcats starting lineup in the matter or a little over 24 hours. UPDATE: Since I started composing this post, Wojnarowski has Tweeted that the Bobcats have given up a protected/conditional future 2nd round pick that the Spurs “will probably never see.” Cool. Someone please ship me a Ratliff Bobcats jersey. $$$. Man, the Centers must be busted up. The Bobcats now have 5.5 Centers on their roster. Ajinca : "Cast on his thumb"
This was a dumb move for the SA spurs, yeah they save money but the don’t solve their problem of finding a big man to help Tim Duncan in the paint. With this trade the spurs made themselves evan smaller upfront,the spurs front office really drop the ball today as the did last year at this time. I think the Bobcats could have gotten what they needed from the "top gun" division at the local Hoop-it-up tournment. I don't really understand this move for Ratliff. The Thomas trade was smart. The biggest stat about Ratliff's career that I like is his BPG. Even this year, when only given a little under 9 minutes a game so far, he's averaging a near full block (0.9) in that time. That spells out a relatively strong presence in the paint to me. Good stuff…as long as Brown doesn't indulge in too much nostalgia and allow Ratliff to eat into Nazr's well earned playing time. Tyrus Thomas is under-weight for a PF. Shaq and “My Friend Andy” will eat him alive. Really interested in what the Cats will do with Tyson during the summer or next season when he’ll be a HUGE expiring. Ratliff is a nice insurance piece. Let’s hope he doesn’t have to play more than 4 minutes a game.